This message will self-destruct… Part 1 October 2018. When the above phrase was uttered to the agents in the TV and Film adaptations of Mission Impossible they all knew what they were expecting and with cool resolve did not overreact. What about something though that self-destructs when you are not expecting it, indeed something that causes shock and surprise? 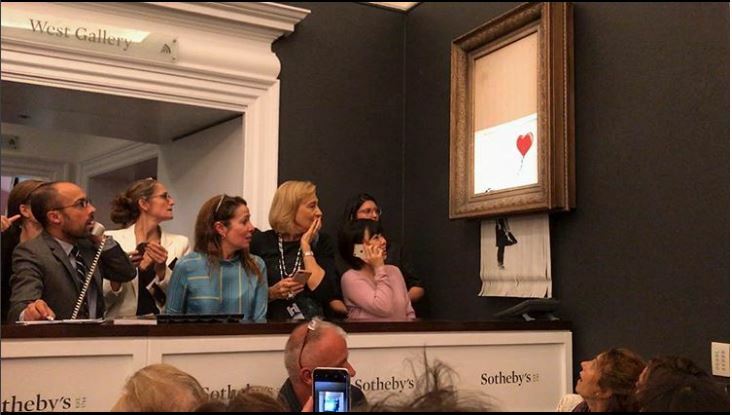 Last week the well-known, yet consistently illusive, artist, Banksy, pulled off one of the greatest artistic stunts of our age. A painting of his, ‘Girl with Balloon’, was actioned for over a million pounds. Moments after the hammer struck on the sale the painting started to go down through a shredder which had been concealed in the frame. It was a moment of shock and surprise, not least for the auction house and buyer. You can watch the moment here. Over the next three days I will posting three blog articles looking at this moment in art history. 1. Watching value disappear before your eyes. As the famed painting was sold and then subsequently shredded at Sotheby’s in London the reaction was palpable. Think of the auctioneer, the buyer, the people in the room. Suddenly, something that had just achieved a price of over a million pounds was now slowly disappearing though a shredder. It makes us ask the question: what is value? Banksy has always shaken up the established art world. They have been able to turn things that have had no apparent value into highly desirable pieces of art work. People have clamoured to get their hands on a Banksy and the kudos that goes along with it. This most recent stunt turns that all on its head. What looked like a good investment, something that would probably sell again in a few years’ time for a much higher bid slipped away in a moment– quite literally – as it went through the concealed shredder. Value in terms of pounds and pence is one thing, but when we look around in life people put value on lots of other things. The value of a good reputation and respectability would be one example where people clamour, sometimes for years, to make sure that they are at the top of the pecking order. There is the comfort that goes with this and there is at least the ability to have bragging rights even if one ends up putting on a veneer of humility along with it. What is it like to see this value disappear though? We don’t have to look hard or wait for long to see an example of wealth lost or reputation squandered. ‘Value’ can very quickly go into free-fall. It is a gut-wrenching experience akin to those that watched in horror as the painting slowly ebbed away. There is another way thought that value, or at least perceived value, can be lost and this – as it transpires – is at the compete opposite end of the spectrum. It comes when we realise that there is something of far greater value to be had, something that is not affected by inflation, stupid decisions, or shredders. Let me tell you about a guy called Paul who had a radical realisation about true value. We read about him in the Bible. He was a Jew and he had all the religious credentials you could ever want. He was at the top of is game and he knew it. Then he met Jesus and he realised that all these religious points that he had been scoring were worth nothing at all. Paul was someone who found surpassing worth in Jesus Christ. This is true value that is enduring. It is not subject to market shifts or artistic stunts. What Paul would speak about so freely has been encountered by so many more through out the ages. It brings peace, comfort and hope; things needed by you and me; things needed by the kinds of people who have just watched their million-pound painting go through a shredder!